What happens when you have a bad cold and sore throat, you’re going twice a week for physical therapy for ankle tendonopathy, your upstairs neighbor had a fire and water is leaking through your kitchen ceiling and the insurance guy has just said, “Better fix this quick or you’ll have a mold problem!” and you’re worried your editor thinks you’re a ditz while you’re working so hard you feel like you’re running just to stay in place? I’ll tell you what happens, your blood sugar goes up for the umpteenth time. Ah, but since these are a new grouping of potential causes than the usual, from what is my sugar rising? Which can I change to have it come down again? The cold will tell me in two weeks, the fire damage may take considerably longer. The book issue is an ongoing event till December 15. If I didn’t have such a blasted headache right now I’m sure I could clearly see the answer to my query. Or, maybe not. Day thirteen thousand, one hundred and forty with diabetes. Will this record ever end? I guess I’m into absorbing new ideas these days as my last two posts are about books I’ve read. There’s an interesting idea expressed in George Leonard’s paper and e-book, Mastery – The Keys to Success and Long-Term Fulfillment. Leonard is a social scientist and Aikido master and I’m intrigued by his call for us to get lost in the ‘practice’ and make peace with riding the plateau. Early in life we are pushed to “do” to “get” and focus on what comes next rather than where we are. We are urged as children to study hard so that we’ll get good grades. We are told to get good grades so that we’ll graduate from high school and get into college. We are told to graduate from high school and get into college so that we’ll get a good job. We are told to get a good job so that we can buy a house and a car. Again and again we are told to do one thing only so that we can get something else, be somewhere else. We spend our lives doing stuff so tomorrow will be better. But where does that leave us today? Sort of checked out from our lives. See any parallels with diabetes? We are told to control our blood sugar so we don’t get complications, exercise so we’ll lose weight, lose weight so we become less insulin resistant. Of course we need to do all those things, but what if we were also taught at the same time to be one with the doing, enjoy the doing, don’t put all your eggs into the arrival; like a Zen master, see value and pleasure in the practice, get lost in it so that you are in the flow, totally in the moment. If you do that, not only will you be more present in your life but you will be creating the best chance for the positive outcomes we all want, and we may even notice and enjoy the journey. When you’re ‘in the practice’ you’ll actually taste your food, maybe for the first time in a very long time. You’ll begin to enjoy the nutty flavor of whole grains by paying attention while you eat them, you’ll notice the natural sweetness in peaches and berries. When you exercise from the practice, you’ll feel your body’s strength and agility, its growing power, you’ll notice the endorphin-rush and Serotonin uptake, you’ll feel happy. Controlling your blood sugar when you are in the practice will imbue you with confidence, you will notice your growing capability, you will actually tune in to feeling proud. When we are so focused on the long, far away and abstract goals of living longer, staying healthy and avoiding complications, we are missing the moment, dismissing the pleasure in the moment and the opportunity for peace and pride in the every day practice. “The real juice in life,” Leonard says in his book, “is to be found not so much in the product of our efforts as in the process itself, and how it feels to be alive.” We are taught in countless ways to value the end product, the prize, the blue ribbon or Olympic medal at the end of an endeavor, that climactic moment, not the pleasure of the moments that lead up to a medal, and then the next medal you might hang on your wall. If our life is focused on mastery instead of wins, most of it Leonard says will be spent on a plateau–that long stretch of diligent effort with no seeming progress, for there are numerous inherent plateaus on the journey: learning, musing, germinating, reflecting, taking baby steps with only little bursts and puffs of what society deems as celebratory, noteworthy movement forward in-between. How much better if we were taught to love the plateau. If you honor the practice says Leonard you will enjoy the plateaus, “if not, a large part of your journey will be spent in restless, distracted, ultimately self-destructive attempts to escape the plateau to move faster and farther,” hither and thither missing the moment. I hope I pass you on your plateau as I sail by on mine and we are present enough in the moment to wave hello. In a book I’ve just read, The Diabetes Lifestyle Book, by three PH.D.s Jennifer Gregg, Glenn Calaghan and Steven Hayes, they examine from a psychological perspective, how we can commit to achieving better health. They employ something called, “acceptance and commitment therapy (ACT)” to move patients through the obstacles that get in their way and talk about how you can overcome your own barriers. If you’ve a mind to do some mind-work, this is a good read. Here’s an example of mind-shifting from their book– it’s a pretty simple, a gentleman had trouble committing to exercising. He, like many people the authors say was using “weather” as an excuse not to exercise. Ted is fifty-five with type 2 diabetes and cardiovascular complications whose doctors are asking him to exercise. Ted made it clear to the psychologists that he would only walk for exercise and that he wouldn’t walk in the rain under any circumstances. The authors asked Ted how firm that decision was for him on a scale of 0 to 100. Ted said 100. Wow, that’s pretty firm! Then they asked Ted why he was coming to their clinic. He said he’d been sent by his doctor so he could better manage his diabetes. Then they asked Ted why would you want to better manage your diabetes? Ted said somewhat confused, “to improve my health.” The authors then asked Ted whether he thought he could do things to improve his health even if they were difficult, and Ted said “of course.” The authors then asked Ted “So why would you be able to do difficult things?” and Ted said, “because I want to live a long life to to see my grandchildren, whom I have a special bond with, grow up. Hmmmm….O.K. Now the authors asked, “What if in order to see your grandchildren grow up you have to walk in the rain?” Ted thought a minute and then said, “I think I need to get an umbrella!” Eureka! The authors then asked Ted again how firm his belief was on a scale of 0 to 100 that he would not walk in the rain. Ted did not even pause before saying “about a 10.” So what happened? The psychologists linked what Ted REALLY wants — seeing his grandchildren grow up — with how he could get it. That’s what was meaningful to Ted, as opposed to the abstract notion of just being healthier if he exercises. 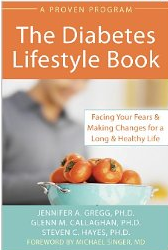 The book is filled with exercises, examples, linkages and stories like these to help you see where you can make stronger links for yourself, more tightly connected with your desires and values, to better manage your diabetes. When I give my motivational presentations I always ask people, “Are you spending more time focused on the everyday tasks of diabetes or what the tasks are giving you – better health, a longer life, more energy, more time with the grandkids, etc? It’s important that we see the benefit of all the work we’re doing. Look to the life you truly want to be living and see your diabetes work as the road. It can be smooth or bumpy, depending upon how you regard it. While you do the work shift your mind from looking down–it’s hard, takes time, hurts, not fair, why me? to up–it gives me more energy to travel, I can wear that great dress at my son’s wedding, and boy, I’m pretty amazing handling all this! You can only start where you are, so start there and don’t resent or beat yourself up that that’s where you are. Enough said, and keep Ted in your thoughts. Right now I imagine he’s racing down the street in the drizzle with a smile on his face because his grandkids are waiting at the end. It was great, I was awesome and I get it — you weren’t listening because you didn’t know I was on the radio or you couldn’t tune in when the program aired. Oh, how lucky you are because any time you chose (within the next 90 days I believe, but why would you wait) you can hear the broadcast by clickinghere. Jane Seley, diabetes nurse practitioner, and I talk for the latter 35 minutes of the 55 minute show and give you the low down on diabetes and using your emotions to create better diabetes management and a happier, healthier life. Yup, all contained in my book, The ABCs of Loving Yourself with Diabetes. Also available on Amazon. All kidding aside, have a listen. I’m pumped and I think you’ll get a lot out of the show. The first 20 minutes of the program if you’re interested featured a nurse talking about how to help loved ones with dementia. It actually was lovely, so if you’re interested give yourself the luxury of the full broadcast. If not, fast forward to between 1/3 and 1/2 into the program and you’ll hear the best Jane and I have to offer. Here’s the truth today, this moment, April 7th, 8:30 PM. As I’m eating dinner I’m thinking do I need to take a little more Humalog to cover the square of Lindt’s 85% chocolate I just gave in to or will my glass of wine balance me out? Did the handful of cooked kidney beans I was noshing on before I had the time to get the fish in the broiler really, really raise me enough worth bothering to cover, after all I did walk six blocks to the library earlier in the day which was an impulsive, unexpected move on my part. Is there such a thing as an impulsive, unexpected move when you are insulin-dependent? What does six blocks buy me? .25 of a unit of Humalog? Need I factor that in if I don’t want to lose my kidney function? Every day, every moment, I have to think whether or not I need an insulin injection or so it feels; it’s not just injecting before meals as much as what have I just eaten and do I need to cover it? Am I going to walk down to the bank this afternoon? Damn, I don’t know where my blood sugar is right now, and at this moment I don’t want to have to care. I’m tired. 36 years tired, 24 hours tired, every 60 minutes tired. I sense there are many of you who know of what I speak. I will keep my chin up, but tonight, right now, I’m just too tired.